When you first begin making candles, the most important question you must ask yourself is what type of candles do you want to make. With all the different candle types to choose from, knowing where to start can be difficult. 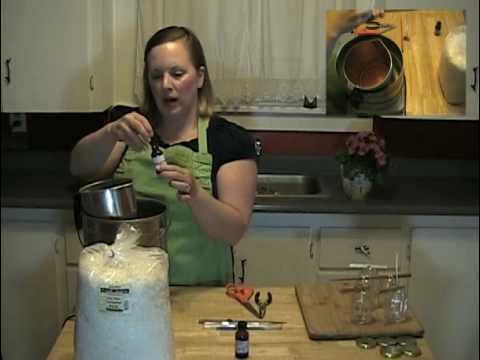 Many folks get into the home candle making business because they want to be able to make their own to fragrance their homes. With that goal in mind, learning to make container candles is probably the best and easiest way to get started. Container candles are considered one of the easiest types to make. The whole purpose of a container candle is to scent the air and while they may not always turn out looking the best to begin with, it is almost impossible to truly mess them up. As long as you start with all of the necessary supplies and a good set of directions, you will soon be on your way to creating awesome container candles. Before you get started, you will need to answer a few simple questions. Once you know the answers to these questions, you can begin buying your supplies. While there are many other supplies you could use, these supplies are the essential ones to make a container candle. When choosing your wax, keep in mind that you will want a wax specifically recommended for container candles. Most candle supply retailers will describe their waxes by sharing when and how they are best used. Sometimes you will even find the word ‘container’ in the actual name of the wax. Next, you will need good, easy-to-follow instructions. Typically, the best place to go for candle making instructions is the supplier where you purchased your candle wax. For example, if you purchase your wax from an online candle supply retailer, they will have detailed instructions for every wax they sell. Simply look up the specific instructions for the wax you have decided to work with. Many of these sites also offer message boards and instructions on how to select appropriate jars and wicks, and can be a wealth of information. If you choose not to research or buy online, there are a number of books available on the subject of candle making as well that can guide you step by step in making the perfect container candle. Making container candles is a great way to introduce yourself to the art of candle making. While you will run into challenges, and may need to make adjustments as you strive to make perfect candles, you will get better as you continue perfecting your craft. The more experience you gain as you pour container candles, the better equipped you will be to expand your candle making skills into different types of candles in the future.